We are at the mercy of the weather when fishing on the Chesapeake, especially this time of year. It’s gorgeous one day, blowing a full gale the next. This week was a perfect example. Nonetheless, striper fishermen from Cape Henry past Point No Point are chasing birds to find fish. I recommend keying in on the bigger ones such as herring or black-backed gulls and pelicans or gannets. Like the larger stripers below, they prefer to feed on the fat bunker (menhaden) in the Chesapeake this time of year. Let’s kick things off with a trip down south. Rockfish heavier than 50 pounds are being caught in Virginia’s part of the Bay. The Cape Charles area from Old Plantation Light to the red #18 buoy near the Concrete Ships has produced quality stripers, as has the Chesapeake Bay Bridge Tunnel rocks and piers and the waters further east. Many fishermen are trolling big lures like Mojos or drifting live eels. Others are jigging soft plastics like Z-Man or BKDs under swarms of birds. 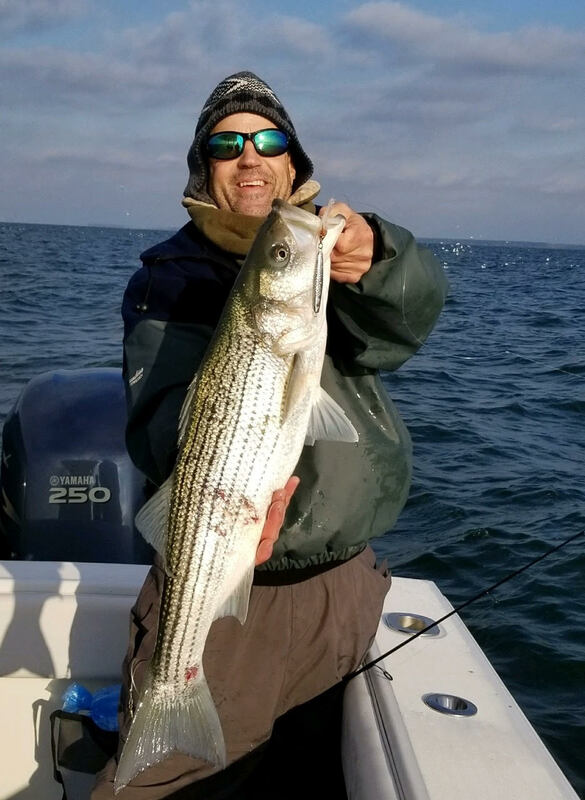 The mouth of the Rappahannock, and the stretch from Windmill Point area north to Smith Point and the Cabbage Patch and Shell Leads fishing spots are also holding nice stripers. Marylanders fishing out the remainder of the season, which closes on December 15, are running from one spot to the next. Up north, anglers are finding mostly undersized stripers around the Bay Bridges above Annapolis. Most of the anglers are trolling heavy parachutes or bottom-bouncing bucktails on heavy, 8- to 16-ounce lines. The latter is old school, and, if you tip the bucktail with a bull minnow or pork rind, you’re going ancient school. But the technique still works. Jigging with 1- to 3-ounce metal or lead-head jigs tipped with soft plastics such as Z-Man, BKDs, and Bust-Em Baits can also do the trick. The fishing spots at the top of Tangier Sound, Richland Buoy, HS Buoy, 72A, and Point Lookout to Smith Point continue to hold some bigger rockfish, some of which push 40 inches. Again, trolling slowly just above the bottom or jigging with soft plastics and lead-heads or 1- to 3-ounce metal Stingsilver and Specialized spoons works, once you’ve found the bait and the fish. Flocks of birds can show up on radar. Follow them. Maryland’s waterfowl season ended last Friday and the big snow storm up north that roared past us caused a big push of Canada geese and other waterfowl into the Chesapeake. My local rivers and creeks are now crammed with honkers. Maryland’s duck season comes back in December 11 through January 26, and the next goose season runs from December 14 through February 2. Winter indoor learning and entertainment begins to heat up on November 28 at 7 p.m. in Towson with Tochterman’s Fishing Tackle fly-fishing expert Rich Dennison, who will talk at the Trout Unlimited meeting at the Towson Presbyterian Church. If you can’t make it, you can watch it live on Tochtermans’ Facebook page.